Rich and the poor. Powerless and privileged. A man and a woman. An infinite space and four walls. The winter landscape of Turkey’s Cappadocia region serves as the backdrop for a clash of systems and values, becoming a silent but key character, a barometer of the protagonists’ moods. The enclosed spaced of a beautifully situated hotel becomes a sparsely decorated stage where a Shakespearean conflict between the main couple plays out. Former actor Ayidyn is suffering from creative impotence and begins to question the value of his publicist. His young wife, Nihal, feels overwhelmed by her authoritarian partner and is ready to choose freedom. 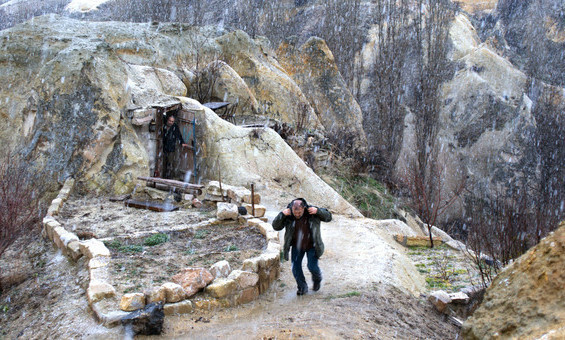 Although it won a Palme d’Or, Ceylan’s three-hour-plus film develops slowly but is not tiring. The majestic, magnetic images are fascinating, and its steady rhythm draws in the viewer. Despite the wonderful dialogue, the most important and most eloquent part of this "sleep" is the silence. Winter Sleep is a psychologically deep journey through the most difficult human emotions that is full of culminations. Nuri Bilge Ceylan was born in 1959 in Istanbul. Having first studied Electronics, he began his artistic career as a photographer. His first short film took part in the competition at Cannes, and his next two were screened at the Berlinale. The Town, May Clouds, and Distant (winner of the Grand Prix at Cannes, as well as an acting award) form a trilogy about the provinces, and escaping from them. In Climates, a story about a couple in crisis, he cast himself and his wife. Three Monkeys, a family drama about betrayal, garnered him an award for best direction at Cannes.His next film, Once Upon a Time in Anatolia, was recognized as the best film at the same festival in 2011. He won a much-awaited Palme d’Or for Winter Sleep in 2014.